ASFA has announced this year's nominations for the Chesley Awards. 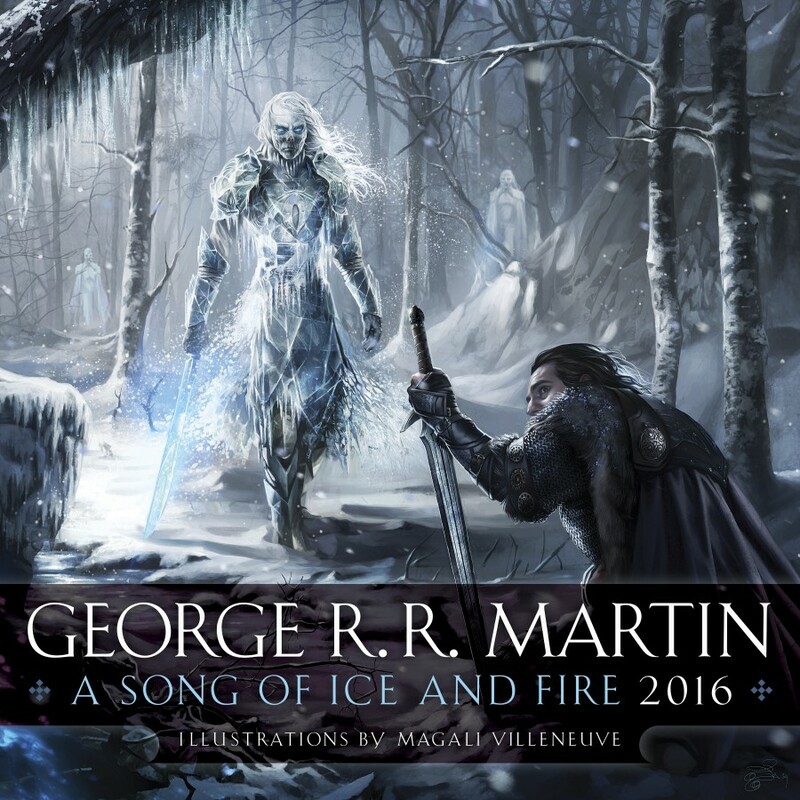 I was very pleased to see that Magali Villenueve was nominated for her extraordinary and beautiful work on this year's Ice & Fire calendar. My congratulations to Magali. She faces some formidable competition, but we'll be rooting for her. She's a very talented young artist, and I hope we'll be seeing a lot more of her work in the years and decades to come. Also, I see that Richard Anderson is up for best hardcover cover for his cover for my friend Vic Milan's novel DINOSAUR LORDS. Well deserved. It's a stunning cover. ((I do wish that the Hugo Awards would get rid of the 'Best Professional Artist' category, and go with a Best Cover award instead, like the Chesleys. Reward the work, not the person)). Oh man...those images. I wish our calendar had 1000 months, I could look at them all day. What an amazing talent she is. Would love to see her draw an image (or 20) from the most recent chapter you read! Spectacular art work! The white walker really resonates a bitter chill and fearful feeling. Good luck to the talented artist. Especially that picture of the Other/White Walker. It's still the closest to how I imagined them looking in the novels, aside from the face. We had a Best Original Artwork Hugo Award for several years. It got so few nominations that we had fewer than five works qualify for the final ballot, and therefore we voted to remove the category. For all that it sounds like a good idea, in practice it didn't work. It didn't work because we did it wrong. The new category should have replaced "Best Professional Artist" instead of simply being added as an additional Hugo. Keeping the old category just encouraged the voters to keep on nominating as they had before, while ignoring the new category. Also, it should have been "Best Cover" instead of "Best Original Artwork." I understand the desire to be inclusive and allow people to nominate interior illustrations, gallery art, and whatever, but the truth is, covers have always been what the artist Hugo is all about. Let's stop pretending it's not. Freas, Emshwiller, Whelan, Eggleton, Donato, Picacio and all the rest won their rockets on the strength of their cover work. No artist who does not do covers has ever won a Hugo. Making it "Best Cover" makes it about the art, not the artist. Writers have a big advantage over artists in that their names are emblazoned on the covers of their books. With artists, we can see a spectacular piece of work without knowing who did it... like, for instance, the incredible cover for Vic Milan's novel, mentioned above. People nominate the same artists year after year because those are the only artists whose names they know. It's very hard for someone new to break through and get their name known. It would be easier if the voters could just nominate say, "the cover of DINOSAUR LORDS," without having to know the artist's name. You have a reasonable point about cover art over other works, but would you then exclude the "cover" artwork for e-books because they weren't printed on pieces of paper? For that matter, should we narrow Best Dramatic Presentation to exclude anything not shown on "broadcast" television (thus excluding Game of Thrones and anything released through YouTube, Vimeo, etc.) or shown in a Major Motion Picture Chain? I know this sounds sarcastic, but it's not! There are people who, when we split BDP, said only "television shows" and "movies shown in theaters" should be considered. Maybe that would still be a popular change? Now I don't expect any fiddling with Hugo Award categories this year — trying to hash out all of the proposed changes to the nominating rules is going to probably force a Day 5 meeting for the second year in a row as it is —, but would you support a five year trial of removing Best Professional Artist in favor of a Best Professional Artwork category? BPA would include any cover art, but wouldn't exclude other pieces. On the other hand, the big problem I see with a Best Professional Artwork category is that you might get noms for books with numerous illustrators. If someone writes down "Whoever illustrated The World of Ice and Fire", do you put it on the ballot? As for a Day 5 business meeting, do we need a rule change to have a cash bar in the back? "He didn't get a Hugo nom," you say. Exactly. Look, I love interior art in books. Once I had enough clout to get my own books illustrated, I did so. Look at the gorgeous Meisha Merlin and SubPress limiteds of I&F, and the more recent trade of A KNIGHT OF THE SEVEN KINGDOMS. None of the art from which has ever been nominated. Much like Vess and STARDUST. There is no point in structuring the category to include interior art if no interior art is ever going to win or be considered. It's like saying, "well, dramatic presentation should include ballet too." Maybe it should. But no ballet will ever win, why not make it explicit what the category is actually about? Well, as you know from the discussions over the split of Best Dramatic Presentation, I was opposed to any change that would have led to the sum of the two new categories being less than the original one, so we possibly will never be able to agree on this. And for that matter, have there not been BDP finalists and even winners (see "Gollum's Acceptance Speech" in the 1994 Hugo Awards) that would be excluded from consideration if we required them to be exclusively "television shows" and "theatrical motion pictures?" Indeed, if we had been excessively narrow in our definitions in such a hypothetical "TV/movie" split, Game of Thrones episodes would not have been eligible on the grounds that HBO isn't "broadcast" television. You know how obsessive people can be about definitions. I wouldn't do it, but I can certainly see other people fussing about it. I think that in general we should let the definitions be pretty broad and not worry about walling off the edge cases. They'll take care of themselves. It's almost as bad as trying to define "science fiction and fantasy," which we do not do, much to the dismay of some of those previously mentioned obsessive types. Hmmm. I think I'm going to admit that I've lost the argument here. You're right. If Vess couldn't get a nom, then it ain't going to happen. I'd like to hear what the artists think, but I'd be willing to support a Best Cover award. And now I'm going to go spend the rest of the night trying to get the Star Wars Ballet out of my head. Chewbacca is giving a standout performance right now. They didn't win, but Phil Foglio and Fiona Staples were both finalists in recent years. And Shaun Tan (twice a winner, twice a runner-up) is, I think, more popular for his picture books than for his covers; I really wouldn't conclude that his nominations were on the strength of the latter rather than the former. Even discounting the past two years for obvious reasons, I see the Hugos as having become friendlier to non-cover art within the past decade. I also think that--in the absence of interference by bad actors--this would be an upward trend, partly due to the internet, and partly due to Hugo voters' growing interest in comics. Phil Foglio and Fiona Staples were finalists in Graphic Novel, not Professional Artist, unless I am misremembering. It's true that Girl Genius and Saga have both been Best Graphic Story finalists and/or winners multiple years, but Phil Foglio was also a Best Professional Artist finalist in 2008 and Fiona Staples was one in 2014. If someone writes down "Whoever illustrated The World of Ice and Fire", do you put it on the ballot? Possibly nowhere, because people wouldn't be eligible for a work category. The book itself would be eligible for Best Related Work if so nominated. However, there's a precedent for Best Original Artwork, in that Dinotopia: The World Beneath won the 1996 Hugo Award for Best Original Artwork, a decision that did not sit well with everyone. No rule change needed, just money. Lots of it. Convention center catering is phenomenally expensive. I'm never going to get away with bringing a cooler into the meeting, am I? Looks like I'll be bringing in a flask or two. That's between you and the Convention Center security. It's not the convention being mean; it's convention centers enforcing their contractual monopoly. This former Hugo administrator would have had no problem accepting the clearly-worded nomination "the cover of DINOSAUR LORDS" (it has only one cover, as far as I know) without the name of the artist. This former Hugo administrator actually did accept nominations for TV episodes that were worded in the form of descriptions of the plots without the titles of the episodes. In this administrator's opinion, it is the administrator's job to do whatever research is necessary to figure out what the nominator intended and gather whatever additional information about the nominees that will go on the final ballot. Some excellent names there, and great to see Magali get recognition. 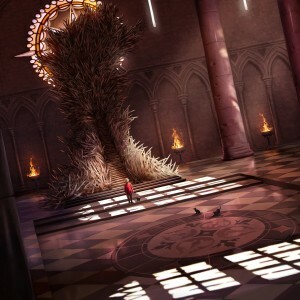 I admit some surprise, however, that Gary Gianni's interiors for A KNIGHT OF THE SEVEN KINGDOMS didn't make it. I was wondering if it just missed the cut-off date for nominations, but I see other works from October 2015 in there, so probably not. Must have had some very stiff competition! Quite curious to see what the Folio Society DUNE looks like. Will the art from this calendar and the others ever be collected in a book? It's getting too pricey to buy older ones individually. 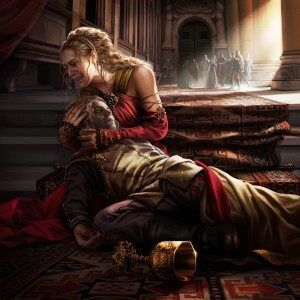 Any chance you'd have a link to the original artwork? This stuff s beautiful, is there any more in Magali's collection? Congratulations Magali. Fingers crossed that you will win. I have the calendar and it is up on my wall. Magali's take of Dany sitting on her silver in pure 'warrior queen' mode is the best drawing I have ever seen of the character. Unlike most drawings, she doesn't look frail and delicate. But more like she should be (for a woman who has spent a considerable time ridding a horse and outdoors) strong, athletic and formidable. I hope that George and TPTB either reconsider their rule of not inviting an artist back for another year. Or at the very least give us another ASOIF art book. That is an iron throne! I somehow wished they wouldve made it like this in the series. :3 I wouldnt have even cared if it was all foam.